Elena Matusevich, her daughter Christina and son Arcady live in Tel Aviv. 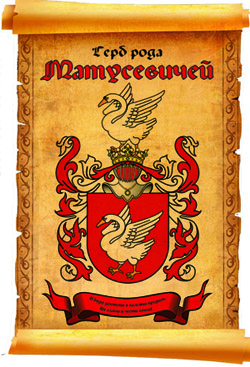 According to Elena, this branch of family - origin from Kislovodsk. Father of her husband - Vitaly Lvovich (now he lives in Israel too, in Ashkelon), was born in 1928 in family of the musician. All life he worked as the violinist in symphonic orchestras of Soviet Union, last years - in Tomsk and Kemerovo. His son - Elena's husband - also was the musician of a symphonic orchestra. Unfortunately, he has died in 1997 and buried in the south of Israel. Elena's son Arcady has served in battle parts of the Israeli army. Now he works on a assembling of furniture and prepares to continue study. Christina studies in 7-th class, adores small children and puppies. In spite of the fact that she was born in Russia and in house speaks only in Russian, she feels herself as fundamental inhabitant of Israel. Elena's profession - the programmer, she has finished university by a speciality "Applied mathematics". Now privately is engaged in rehearsing. Artist Michael Matusevich, who lives in Tel Aviv, according to Elena, is not the relative to her family, as well as Konstantin Matusevich, the known Israeli sportsman in high jumps.